You Are Here: Home > KMA News > Medical Blog > Advocacy > KMA Special Legislative Minute: A Message from 2019 President Bruce Scott, M.D. 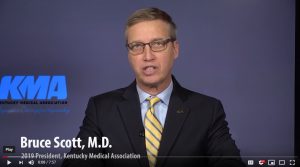 With the 2019 Kentucky General Assembly underway, KMA President Bruce Scott, M.D. provides an overview of the Association’s top legislative priorities and urges members to stay engaged to ensure this year is a success for physicians and patients across the Commonwealth.